Last week I spent a few days with my friend Emma, an amazing cook, kid wrangler, dog herder, blogger, and cookbook author. I was lucky enough to get a copy of her book Whining and Dining, which I can barely wait to cook my way through as the recipes all sound so yummy. These muffins were a perfect solution to the bananas falling out of my freezer, and Kevin loved them tucked into his lunchbox. Not too sweet, but still chocolaty, they make a great snack. Pre-heat oven to 350 F, and either grease a muffin tin with butter or line cups with paper liners. In a large bowl, whisk together the sugar and melted butter. Add the eggs one at a time, continuing to whisk, until well mixed. Stir in the oats, banana, buttermilk, and vanilla. Set aside. In a separate bowl, stir together the flour, baking soda, and salt. Add the flour mixture to the butter mixture a third at a time, folding in gently after each addition until just barely combined. Stir in the chocolate chips. 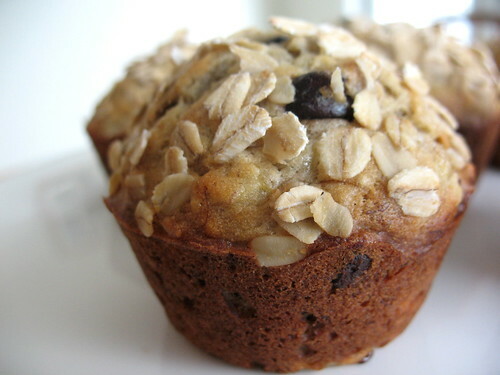 Spoon batter into muffin cups and if you want, top with a sprinkle of large flake oats. Bake the muffins for about 20 minutes, until a toothpick inserted into the center of a toothpick comes out clean. Remove from the muffin tin and allow to cool completely on a wire rack.